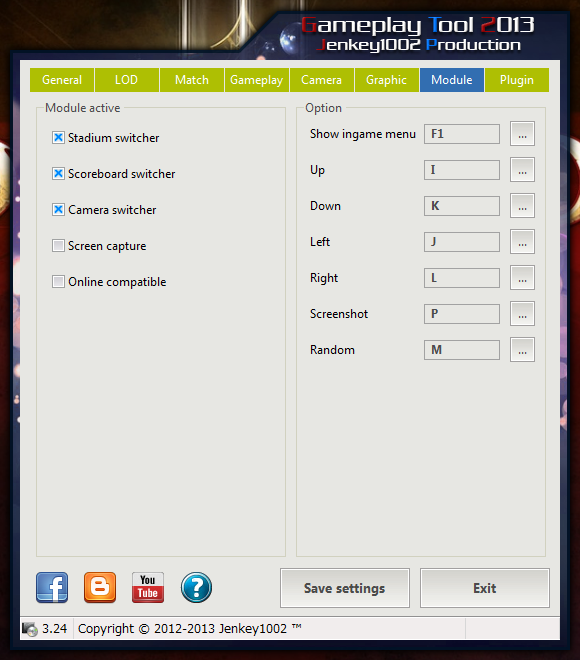 Gameplay tool 2013 is an add-on program for Pro Evolution Soccer 2013 and Pro Evolution Soccer 2013 Demo. It is a loader and manager for various modules, where each module is built as a (typically) independent DLL containing logic to enhance the game in particular aspect. Gameplay tool allows to adjustment game with your opinion. Beside gameplay patch, there are many addition features. After got many negative feedbacks about chantserver, I decided to remove chantserver permanently, from version 3.25　gameplay tool won't support chantserver anymore. If have error with "kload.dll", you have to copy "kload.dll" in "Gameplay tool" to kitserver folder & overwrite the older one.